This album is a tribute as well as a celebration of the years of warm and heartening companionship I have felt with all of you. An ancient shloka tells us that during the times of the Swati Nakshatra, asoociated with the goddess Saraswati, rani drops trapped in oyster shells turn into the most flawless pearls. The seventh fifth birthday of Sangeet Martand Pandit Jasraj has provided us a golden opportunity do drive down to the bottom of the infinite ocean of his music and open some of these oysters thus presenting you with this string of pearls. If we have omitted any names in thanking those who have made this possible please do forgive us. “Janata mein janardhan atma so paramatma jo aap sab mein Hai,” is what Pandit Jasraj Says to his audience in a humble salutation to them before commencing al his concerts. 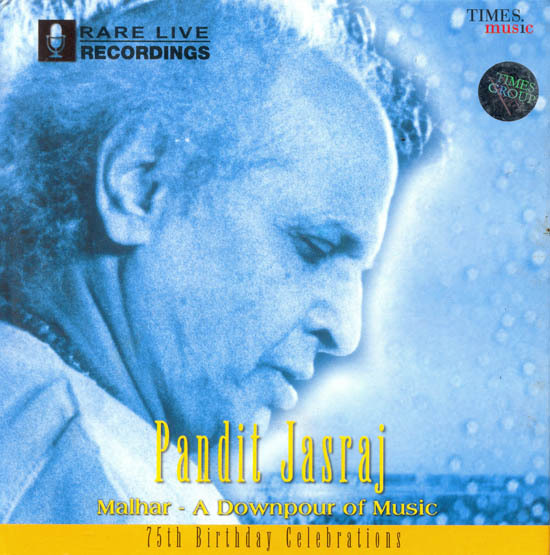 With the same reverence and thankfulness, the family of Pandit Jasraj presents to all his fans and admirers a few recordings taken his concerts. Malhar is the Raga of the monsoon, a time when the Gods rain nectar from the heavens. It is a downpour of the munificence of the Divine. And it is only His munificence that has mysteriously conjured up the notes of the Malhar Raga. There could be no other plausible explanation for this. We have heard fantastic tales of how the legendary singer of the medieval times, Mian Tansen used to summon wild deer in presence simply by singing the Todi Raga but would you believe that it is possible even today? Varanasi's Sankat Mochan Hanuman Mandir is famous for hosting an annual music conference to commemorate Hanuman Jayanti, a festival that Pandit Jasraj has been singing at most religiously even today. The whole music festival is held in the temple hall before the main deity. At one such concert in 1996.just as Panditji was warming up with the notes of Todi, out of nowhere, suddenly a deer appeared in the temple and bounded up to him right in the midst or hundreds of listeners seated there. The dumbstruck audience watched, as it stood there motionless, listening with rapt attention to his singing. In the absence or any video recording, the only witnesses to this extraordinary incident are the music lovers of Varanasi who still talk about it in awestruck tones. Another such miracle happened in New Delhi at the residence of a very distinguished diplomat in the Government of India, Mr N. K. Singh. The distinguished audience comprised the 'Who's who' of' she capital along with several foreign dignitaries. The weather being warm, the concert had been arranged in the outdoors in the spacious lawns. Panditji began with Raga Bihag. The whole ambience was so pleasing that from the very note 'Sa' there was no doubt in anyone's mind that it would be a great performance. After a brief interval, Panditji started singing Dhulia Malhar. Before commencing, he explained to the audience that the word dhulia came from 'dhool' meaning dust and that this Raga was so created as to quieten the hot dust storms that usually precede the rains. As he sang, a sudden rumbling was heard in the skies. A few raindrops fell to the ground that soon turned into a veritable n ur.11te concert had to be interrupted midway and resumed indoors. A few doctors were conducting an experiment on the effects of Indian classical music on the human physiology. They came to the conclusion that Pandit Jasraj's rendition of the Gorakh Kalyan was known to lower high blood pressure and that his Raga Darbari was known to induce sleep in insomniacs. Similarly, his Nat Narayan was known to calm down mentally disturbed patients. This is still a nascent field and a lot of research needs to be done. Tabla: Kumar Bose, Swapan Chaudhari, Vijay Ghate, Balkrishna Iyer, Kedar Pandit. Vocals: Chandrashekhar swami, Girish Wazalwar, Sanjeev Abhyankar, Sadhana Sargam, Durga Jasraj, Rattan Mohan Sharma. Recordings courtesy: Shri N K Singh Bhikubhai Bhavasr, Indian Music Group Malhar Festival, St. Xaviers College, Mumbai, Sadarang Music Festival, Kolkata.